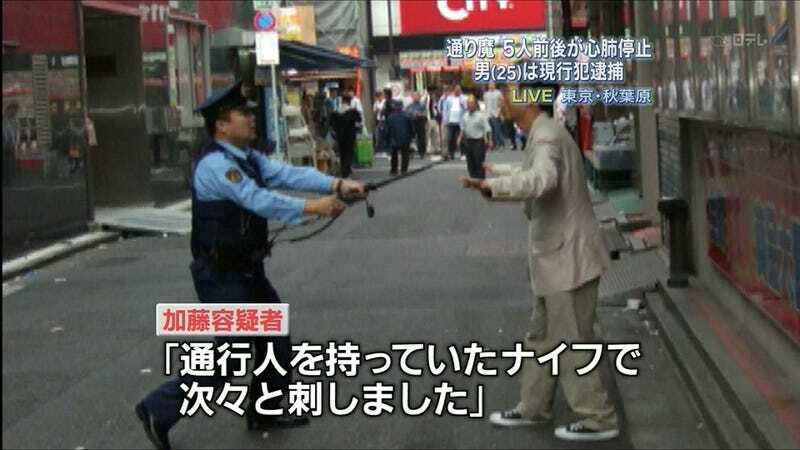 On June 8, 2008, 25-year-old Tomohiro Kato drove a rented truck into a crowd in Tokyo's geek paradise, Akihabara. He got out and began stabbing random pedestrians. In his wake, seven were left dead and ten injured. Today in a Tokyo district court, Kato was sentenced to death. The presiding judge stated that Kato was of sound mind and the killings were premeditated. Before the killings, Kato apparently posted messages on a website, stating that he was going to kill people in Akihabara. He picked Sunday, because the main street in Akihabara was closed to vehicles and crowded with pedestrians. In the days following the attack, the Japanese mass media tried to make a connection between his attack and video games, basing their conjuncture on a picture he drew in high school of character in role-playing game Tales of Destiny. While the defense attempted to avoid the death plenty, Kato is previously quoted in a letter to one of the victims as saying he should be sentenced to die. Kato, now 28, wrote, "My crime deserves death." Earlier this year, Akihabara began closing the main drag to vehicles on Sunday and is once again only open to foot traffic.